A Pittsburgh, Pennsylvania, criminal defense lawyer has created a storm of controversy following the release of his YouTube video commercial. 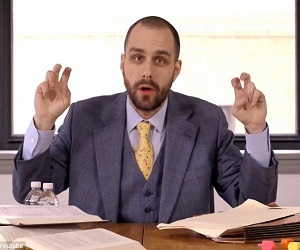 In the three minute, 27-second clip, Daniel (“Dan”) Muessig declares, “laws are arbitrary”. “I may be a lawyer, but I think like a criminal,” he claims in the ad, which features fictional criminals thanking the lawyer and has gone viral online since being uploaded last week. At time of writing, Muessig’s “Thanks Dan” video has been viewed nearly 170,000 times and has led to interviews with US news sites and the BBC. Muessig is not the only US lawyer to raise eyebrows with a promotional video this year. Last month, NZ Lawyer reported on Savannah-based personal injury lawyer, Jamie Casino, who’s Superbowl half-time ad featuring flaming sledgehammers and a heavy metal soundtrack received nearly three million hits on YouTube. by TM 15/03/2014 5:39:47 p.m. This reminds of Oliver Wendell Holmes Jr's 'bad man' theory of law, no? by Julian Hannam 20/03/2014 2:55:51 p.m.